FLASH 5 Bars are different. They don't taste like other nutrition bars. They taste like delicious Real Food because they are made with delicious, premium quality, real food ingredients. FLASH 5 "Trail" Bars are Un-coated...No more messy warm weather melting. 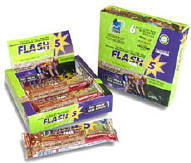 FLASH 5's unique 6-pack boxes are dual-purpose, serving as tear-open self- merchandisers for individual bar sales, and also as 6-pack boxes. Today's nutrition bar consumer appreciates the value of buying by the box. For nutrition information on each of our bars, click the links below.